The Tivoli's storefront entrance in Westport. "Through the years, the Tivoli has managed to adapt to the changes that have happened in the film industry. Today, however, that is no longer the case," he added. "The combination of the age of the facility, my advancing age and health issues, along with the radical shifts happening in (the) movie business have made it impossible for me to continue." The original location was a 104-seat, one-screen theater on Westport Road, formerly the site of the Bijou Theater. 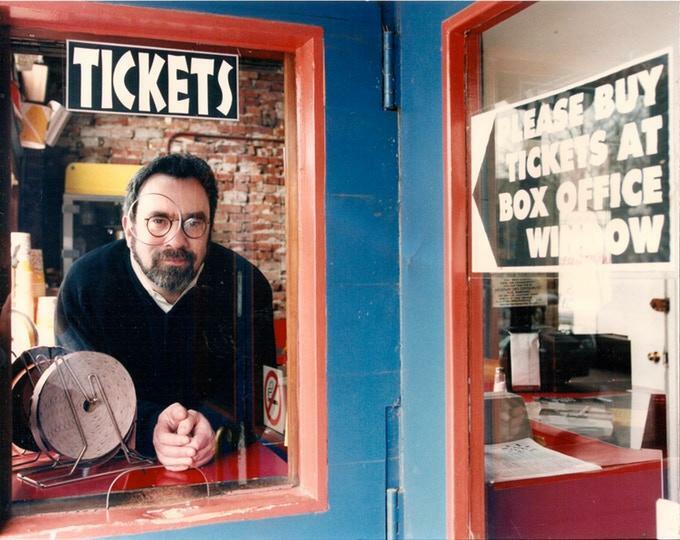 In 1992, the Tivoli expanded to three screens with a move across the street to its current location in Manor Square, showing first-run independent and foreign films, and performing arts broadcasts, as well as hosting film festivals and film classes. With the phaseout of movies shot with 35-millimeter film, a Kickstarter campaign in 2013 helped raise more than $130,000 needed to convert the theater's auditoriums to a new digital projection system. Jerry Harrington as he appeared in a photograph on the 2013 Kickstarter campaign page. "The people of Kansas City have been generous beyond anything I could have imagined," Harrington said in his email. "But, the Tivoli can no longer survive on ticket sales alone and the costs of maintaining operations are insurmountable." He thanked his landlords for working with him to find a solution to renovating the theater to keep it going. He also extended "a big thanks to my staff who have kept the Tivoli running the last couple of years while I tried to get my health back together. They have been especially kind, helpful and professional." His greatest thanks, Harrington said, "goes to all my loyal customers over the years. Many of you I have gotten to know personally, and will miss you all the most. My deepest heartfelt thanks and appreciation for allowing me to provide you with some of the best films any theatre could have ever shown." Harrington did not immediately respond to messages requesting comment. Editor's note: An email sent to patrons on Tuesday stated that final screenings at the Tivoli would be Thursday, April 11, instead of Friday, April 12.
Who in Kansas City remembers AIDS activists smashing vials of HIV-positive blood in City Hall, and abortion opponents trying to display fetuses in coffins at Planned Parenthood protests? It was 25 years ago, so you’d have to be a certain age to remember. And you’d need to have been paying attention to the news. If you want to catch a flick in Kansas City, there are plenty of options. You could stream movies from your own couch, or venture out to a multiplex for an IMAX screen experience. We explore what keeps so many Kansas Citians going to smaller, independent movie theaters.